Video: Rachel Maddow interviews Michigan Radio reporter on Gov. Snyder’s refusal to comply fully with order from Environmental Protection Agency on Flint water crisis. 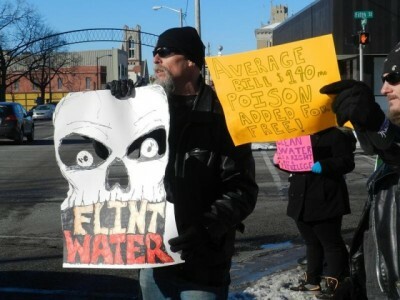 Protest against Flint water poisoning, high bills. Keith Creagh, the new Director of Michigan’s Department of Environmental Quality, is questioning the legality of an order from the USEPA that Michigan make some substantial changes in their response to the catastrophe in Flint. The political and regulatory blame game taking place as Flint’s water and public health crisis unfolds, took another turn Friday with the new head of Michigan’s Department of Environmental Quality saying the state will comply with a federal order regarding the handling of the emergency, but is taking a combative stance in doing so. First, DEQ Director Keith Creagh questioned the Environmental Protection Agency’s legal authority to make such demands. Then he disputed EPA Administrator Gina McCarthy’s contentions in her emergency order sent to the state Thursday that the state has delayed corrective action in Flint, where high lead levels were found in drinking water. Keith Creagh, new head of MDEQ, previously led the Michigan Dept. 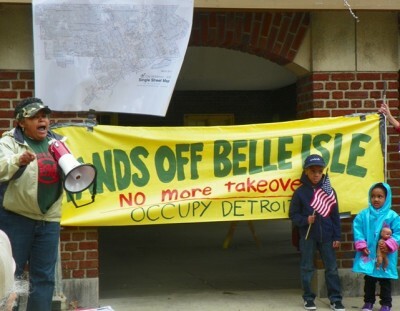 of Natural Resources, which led campaign for state take-over of Belle Isle. Here, Monica Lewis-Patrick speaks at rally againt takeover Spet. 22, 2012. The state and the city of Flint. It ordered them to inventory all the lead service lines in the city — an unknown number — and demanded the state create a publicly accessible website to post results of water sampling and reports. Maddow will host a Town Hall Meeting in Flint, “American Disaster: The Crisis in Flint” on Wed. Jan. 27 at 9 p.m. Guests will include Flint Mayor Karen Weaver; U.S. Sen. Debbie Stabenow; Dr. Mona Hanna-Attisha of Hurley Medical Center; Lanice Lawson, creator of Bottles for Babies; Curt Guyette, reporter for the ACLU in Michigan; Brynn Mickle and Ron Fonger of The Flint Journal; and Detroit Free Press columnist Nancy Kaffer. This entry was posted in Uncategorized and tagged Beatbackthebullies, blacklivesmatter, blacklivesmatterDetroit, BoycottMichigan, Detroit2Flint, DirectActionNow, Flintlivesmatter, FlintWaterCrisis, GeneralStrike, JailSnyder, OurWaterOurVote, PoliceState, PrisonNation, SaveBentonHarbor, SaveDetroit, SaveFlint, SaveHighlandPark, saveourchildren, SavePontiac, StandUpNow, StopWaronBlackAmerica, WATERISLIFE. Bookmark the permalink. It is my understanding that NO Spanish language information about the lead poisoning in the water has been provided to the public.